There are many different species in our area. Some are a harmless nuisance while others can do significant damage to your home. There are two kinds of ants, some that will nest in wood and some that will nest underground. Any wingless ant you see out of its nest is an adult sterile female worker of that particular species no matter the size or color. 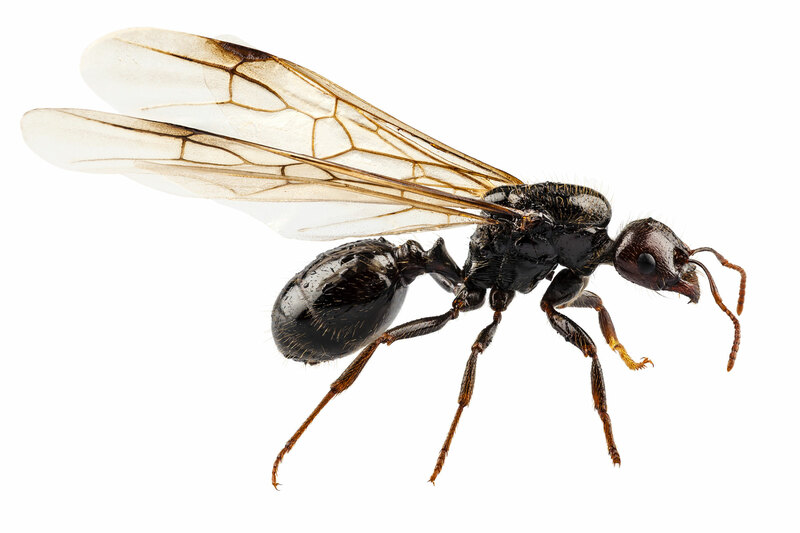 Winged ants will be male or female reproductives of that species. Common species in our area include the carpenter, pavement and the odorous house ant. Carpenter ants do not actually eat the wood they simply carve out galleries to live in. Often, they spit out the wood and other debris from the nest. This material, called “frass”, can usually be found near the nest. They usually choose wood that is getting water damage of some kind. Since they do need food it is common to find ants in the kitchen. The most common species is usually black and about ½ inch long. There are many different treatments available including baiting and residual spraying. Either method has many different possibilities depending upon the situation. The best control usually involves locating the nest and treating it with an appropriately labeled insecticide. We spend the time to find the nest. We have found that most ant nests are located on the exterior walls. Consequently, most of our treatment is to the outside to target likely nesting areas. We offer flexible service plans designed to fit your particular circumstances and budget. Treatments are part of our residential service plan or an annual “ants only” service plan.